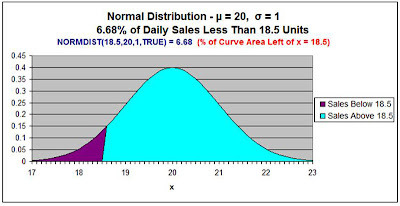 This article will show you exactly how to use the Normal Distribution in Excel to calculate the probability that your daily sales are within one of two given ranges. 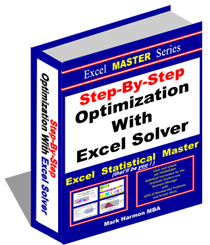 The advantages of statistics in Excel to solve business statistics problems is that most problems can be solved in just one or two steps and there is no more need to look anything up on Normal Distribution tables. 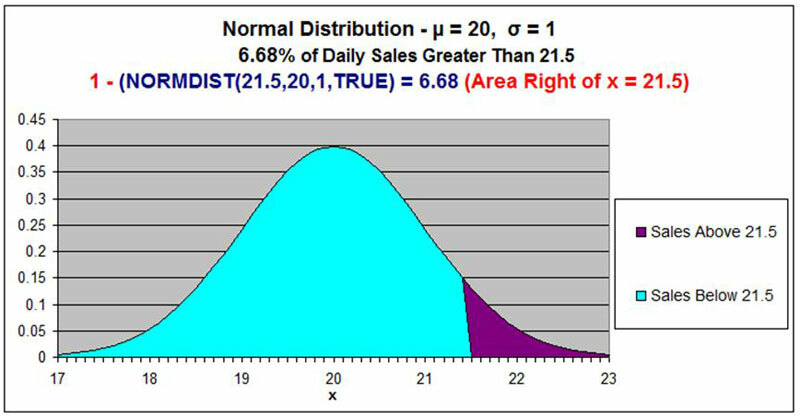 As with any statistical test that uses or depends on the Normal Distribution, as assumption is made that your sales data is Normally Distributed. If you have at least 30 days of sample data, this is probably a reasonable assumption. Even so, you should always test for Normality prior to performing any parametric test or analysis. 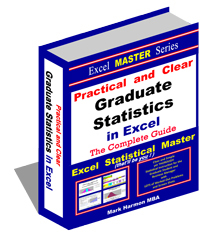 Parametric means using or depending on a statistical distribution such as the Normal distribution. This blog contains a number of articles about Normality tests and nonparametric tests that are used in the event that your data is not Normally distributed. The daily unit sales of a commercial web site are normally distributed with a mean of 20 units sold daily and a standard deviation of 1 unit per day. 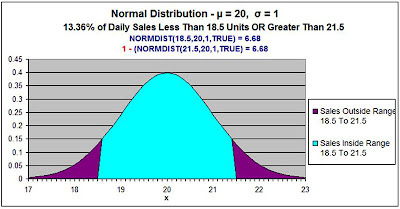 Normality tests were performed on the sales data to verify that they are normally distributed. The sales results from one random day are selected. What is the probability the sales from that day will be either more than 21.50 units sold OR less than 18.5 units sold? 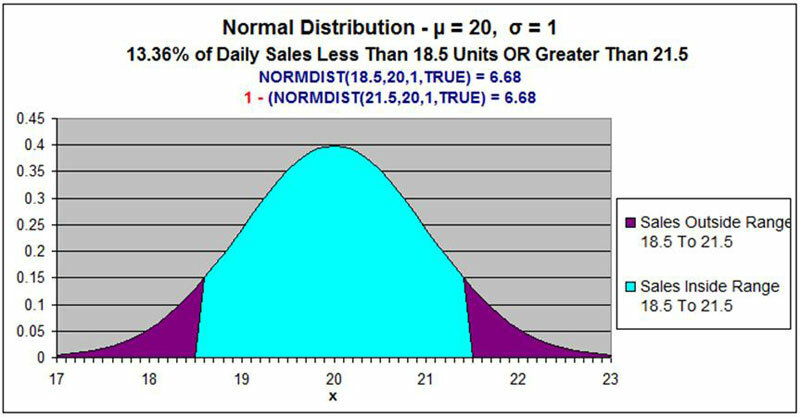 Since we are solving for a probability (area under the Normal curve) for a Normal curve that is not standardized, use NORMDIST. The OR statement requires that the answer contains all elements of both sets. 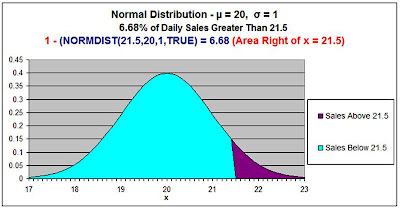 The shape of the Normal distribution resembles a bell so it is sometimes called the "bell curve." The Normal curve is symmetric about its mean in the middle, and its tails on either side extend to infinity. The Normal distribution is a continuous function, not a discrete function, This means that any value can be graphed somewhere on a Normal curve. Discrete functions only map specific values, such as whole numbers. 1) Mean - µ - the Greek symbol "mu"
2) Standard deviation - σ - the Greek symbol "sigma"
If the mean and standard deviation of a Normal distribution are known, then every point of the Normal curve can be mapped.